Elite is manufactured with new and innovative construction techniques. It features "Stabil-Lok" leg design for accurate leveling and stability. The new custom full view dome provides an unrestricted, distortion free view during play with no overhead scoreboard interference. Dome locks down for showroom display and prevents puck loss. Game completely assembled. Just bolt on legs. The cabinet design offers a clean look with no exposed bolts. "Stabil-Lok" steel base with leg levelers is durable and easily assembled. New puck design provides realistic and fast action hockey play. The "Puck-n-Play" feature allows hands free use of the puck. No more dropping the puck! "Dyno-Ice" poly play surface for lightning fast passing and thinner slots for better puck control. Sliding gear mechanisms with heavy duty rods feature moving clutches to prevent binding. Made of self-lubricating Delren plastic for extended life and durability. Electronic scoring system has start buttons on each end. The electronic scoring tracks the score from both ends of the game in full audio and utilizes infrared sensors for accuracy and repeatablity. Game size: L 53.5" (64" with rods) x W 35" x H 43". Carton size L 66" x W 37" X H 17.5". You need a domed hockey game that is built to take a beating, night after night. After all, hockey players deliver some hard hits. So if the game's too light, trust us, it will fall apart. Then what are you left with? A rinky-dink rink. Major disappointment. Zero fun. That's the penalty for buying an inferior "box", which is why CARROM® Stick Hockey is the right choice for you. It's made with care in the USA using only top-quality components. It's every bit the product other domestic games are -- at a much better price. Check the specs. Rugged assembly. Vacuum-formed, shatter resistant dome for strength and exceptional optical clarity. Gears that will stand up to the extreme mechanical stress generated by frequent extended play. Plus much, much more. So go ahead. Knock yourself out. Slide the solid fiberglass rods like mad. Spin your wingers and forwards like dervishes. Fire slap shot after slap shot toward your opponent's goal. This is one tough game. It'll take whatever you dish out, period after period. Period. Heavy cabinet will not move during play, yet it is easy to move for cleaning and vacuuming. Cabinet and legs are covered with a heavy, glossy vinyl which is highly resistant to wear and use. The vinyl on the legs and the leg materials will resist denting by a vacuum cleaner and use. Glossy white, polished fiberglass rods will not bend and retain their straightness. Realistic and lifelike players in red and blue colors add to the red, white, and blue, Made in USA message that this game projects. All sliding and gear mechanisms feature moving clutches, made of self lubricating space age plastics to extend life and prevent binding as well as protection during rough play. Rubber handles provide a sure, cushioned grip on the non-bending polished control rods. The smooth action puck return mechansimsm allows immediate restart after each goal. Rubber leg boots provide both a means for accurate leveling and help eliminate table movement. Playsurface has rugged protective coating over all graphics and colors to add to the life and beauty of the game. Game assembly is approximately 2 hours with all necessary parts and complete instructions included with the game for ease of assembly. All game components are exclusively engineered by Carrom using its 100+ years of game and toy making experience and expertise. 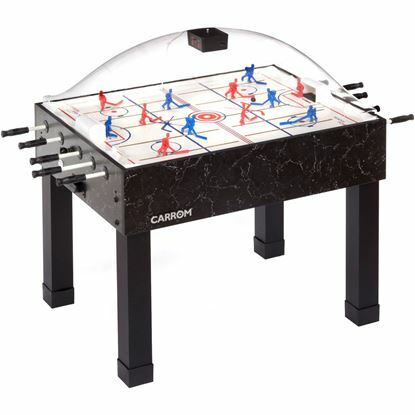 This game is finely constructed by Carrom in Ludington, Michigan using only the most durable of construction materials to provide years of rugged play enjoyment. 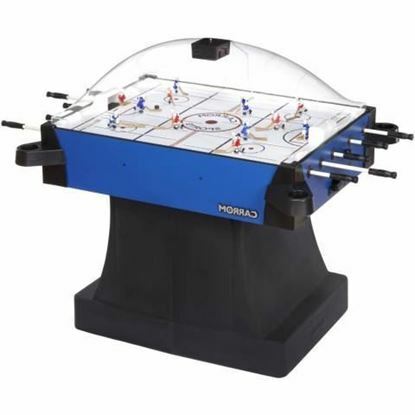 Dome prevents spills and messes from beverages and keeps the playfield dust free. Dome is highly shatter resistant and allows clear vision from all angles of play. Dome is easily removed even after game assembly. Dome comes complete with start play puck entry area to begin play in a fair manner. Scoring unit creates play excitement with sound and lights.